Heavy Duty box Lids with various openings for multiple applications. 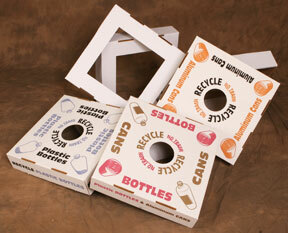 These attractive yet inexpensive lids hide the trash and recycle materials inside the box. For recycling the 4-1/2″ diameter holes are large enough for a 2-liter plastic bottle. A larger hole invites contamination. The 12″ square openings are for trash and the 2″ X 14″ slits are for paper. Fits Keeptidy Boxes, select 18″x18″ self locking boxes.